Did you ever wonder what that plastic piece in the center of your pizza was called? It is called a package saver, and it helps prevent the box from damaging the pizza. According to an article on About.com, it was invented by Carmela Vitale of Dix Hills, NY, receiving a patent on this device in 1985. So, what does this have to do with anything green? Just think. How many times does your family order pizza? How many package savers are being thrown away? Multiple this by twenty plus years of package savers times the number of people who order pizza. The thought is staggering. So, what can you do with these disks? You could wash them and return them to your pizza place for their reuse. I don’t know if they would accept it, but worth a try, or you could come up with a way to reuse it. My vegetable garden is always my inspiration how to reuse trash. I sow seeds right into the soil, and place a straw near where I planted the seeds. Sometimes, I still can not find them. Better yet, I forget to label what I planted! The other day, I put a package saver right near or over the seed that I sowed. It was a lot easier to stick it in the soil then my plastic straws. In the case of putting the disk right over the seed, it gives the seed a little shade if it a cooler weather type seed, or I could write right on the plastic what it is I planted. Sometimes my seeds do not germinate or they take a long time to germinate. 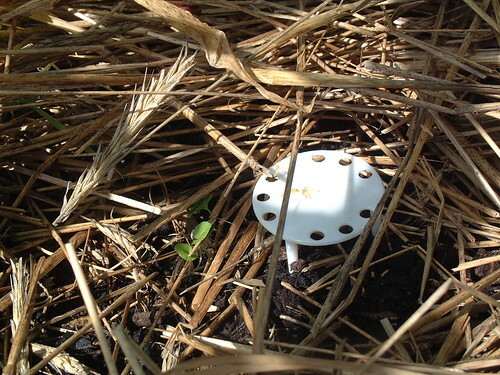 Putting the disk near the seed, I am able to watch where the seed was sown to replant if the seed does not germinate. Do any of you have any suggestions how to use a pizza package saver? How about a clever way to use something else that would ordinarily go into the trash? List your ideas in the comments! Don’t forget to recycle the pizza box too! My 7 year old loves to make ‘junk sculptures’ out of all sorts of used stuff – including those funny pizza things! He puts them together using hot glue (supervised, of course) or regular glue. It’s a great reuse idea! I keep a bag of ‘junk’ ready to be used any time with everything from yogurt cups to styrofoam pieces to paper rolls. Lots of fun! Micaela-alot of people could learn from your son. He sounds very creative! Your comment made me think. Perhaps, parents should ask their schools ( especially their preschools) to see if any items that they would ordinarily recycle (such as paper towels, newspaper, junk paper) or items they throw out, if the schools can use them for projects. Remember that plastic container from the grocery store that you don’t need? Maybe it can be used to keep some supplies in it. There are a lot of items that can be reused in gardening. You can make all types of pots for interesting containers out of all sorts of junk. Just a example would be an old toilet. you end up with two seperate pots. It is simply nuts the amount of plastic that gets thrown away. Especially given the source used to produce it (oil) is going to run out. I think schools are probably one of the best ways to reuse bits of unwanted plastics, especially for projects. And its a great way to teach them at an early age about recycling. I used to use those pizza savers for tables for my barbies. They may be a little small, but it never mattered to me, haha. I guess thats a good tip if you have little ones at home.